Nemo Memo – Last Minute Musical Gifts for Yourself! Kensington’s remarkably small, weatherproof FX 300 universal portable one-piece speaker is an instant favorite at MyMac. Washing the kitchen floor yesterday, I hooked its strong, flexible D-ring to my belt, as I listened to most of the current MyMac podcast with maximum convenience. Two AAA batteries are included. They insert easily into the interior battery compartment. When you turn on the power using an exterior volume control knob, a small interior green LED light glows. Suggestion: have an exterior power indicator light instead of, or in addition to, the speaker’s interior one. It’s too easy to leave FX 300 turned on and draining battery power, without knowing it. Sound is clear and free of distortion at most listening levels. FX 300 responds to volume adjustments on both your music player and the speaker’s own black volume knob dial. Another suggestion: it’s difficult to tell at a glance where the exterior volume knob is set, because it and its indicators are too dark, so make them much easier to see. Purchasers have three choices when deciding which type of AAA batteries to use. Cheap and easy are generic throwaway single use alkaline, available worldwide. Lithium ion long-life single use batteries are harder to find, and are a bit more expensive, but they should provide longer usage. Best of all are rechargeable AAA batteries and a universal charger, which is what I’ll be using when the original batteries run down. In the interest of speedy “first listen” publication, I don’t yet know how many hours of continuous or occasional listening FX 300 will provide on a single set of batteries, but I’ll find out soon enough. “Up to 10 hours” is Kensington’s claim. I’ve already gone past that, FYI. 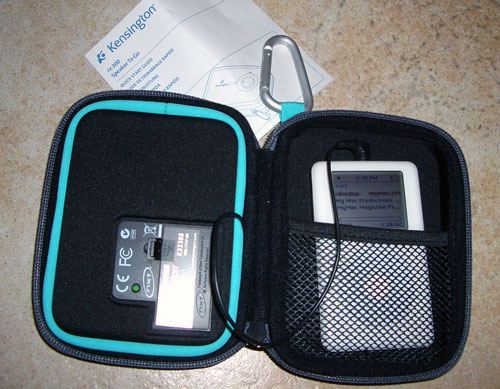 In everyday use, unzip FX 300, place your iPod into the speaker’s interior mesh restraining area, attach the built-in audio cable, start your iPod playing, zip up FX 300, turn on exterior power knob, and boogie until dawn (or until your floor is fully mopped). The NXT integrated housing speaker won’t win any audio awards, but it’s darn good for casual listening to all genres. Kensington’s two-year warranty is generous, as is FX 300’s weatherproof construction plus ultra-compact design and engineering. It’s late in the 2008 shopping season, but it’s a perfect time to buy as many of these handy dandy portable speakers as you can. They’ll make great gifts for all occasions. Remember to obtain a few extras for yourself: one for the car, and one for the house, at the very least. Exceptional value and versatility. RECOMMENDED with a MyMac rating of 4 out of 5. Excuse me while I wash the windows and listen to the rest of our podcast. The clever engineers and designers at iFrogz have two models of affordable, stylish headphones that online purchasers can customize in “more than 200,000 finished options.” MyMac chose Fallout, because this model is described as being super comfortable. The online design and ordering process is speedy and efficient, followed up by a confirmation email with a phone number for customer support. When I called iFrogz, a knowledgeable staff person answered quickly, with helpful answers. The company has done a masterful job making the entire process as good as we’ve seen, especially considering how many things can possibly go wrong in a custom job. 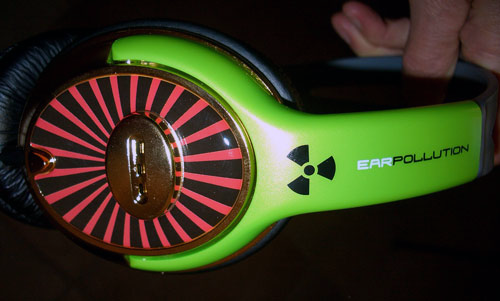 My Fallout headphones arrived a week after I ordered them. They appear exactly as I designed them. Materials and construction are better than expected, given the low price. Custom colors and patterns are first rate. iFrogz doesn’t say much on its web site about audio quality. I am extremely demanding on headphones. Sound delivery is surprisingly robust, very good for casual listening, and superior to iFrogz’s other, non-custom models (which MyMac doesn’t recommend). Fallout is a bit snug at first, but the fit and feel definitely are comfortable. Multiple user-configured headband, side pieces, speakers, ear cushions, and artwork are each designed as part of your ordering process. iFrogz’ EarPipes model has more custom options than does Fallout. I’ll obtain some EarPipes in 2009, and write about them in a future MyMac article. If you have personal experiences with either model, please let us know. In a sample Fallout listening survey, here are my results: VOCAL MUSIC (Enya) is rich and clear; POP (Hilary Duff) is strong on treble; ORGAN (Virgil Fox) has a nice distribution of tones; FOLK (Peter, Paul, and Mary) has balanced mid-range; COUNTRY (Dixie Chicks) is slightly recessed, but even overall; BLUES (Charles Brown) sounds wonderful; GEEZER BROADWAY (Bing Crosby) is perfect; and CONTEMPORARY LATIN (Rosario) is very present. I could go on, but you get the idea- comfort, custom style, and value from iFrogz. MyMac rating: 4.5 out of 5. PLEASE NOTE: Both items reviewed here are “first listen,” because I want to get the word out as quickly as possible for holiday shoppers and gift-givers. If serious flaws develop, they will be reported in MyMac Magazine.